The RSIC-U® / RSIC-U HD® is designed for use with various wall designs. 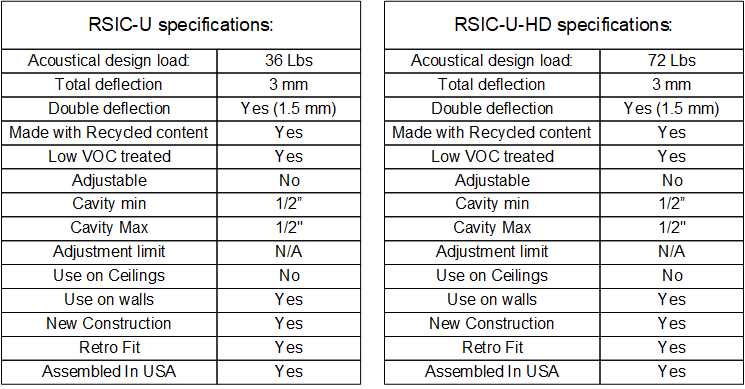 The RSIC-U® / RSIC-U HD® decouples the wall framing from the floor and ceiling structure. The RSIC-U® system eliminates flanking paths normally caused by a wall directly connected the floor or ceiling. When combined with the RSIC-1 wall system the highest possible noise control can be achieved by preventing noise from passing through wall framing into the adjoining structure. The RSIC-U® / RSIC-U HD® works directly with the RSIC-1 to achieve total decouple walls from the structure.